This entry was posted in Brighouse, Dec, Get Involved / Have Your Say, Nov and tagged Choir, Competition, December, Get Involved, Kershaws Garden Centre, Longroyde Junior School, November, School, St Andrew's Infant School, St Andrew's Junior School, St Joseph's Primary School, Young People. 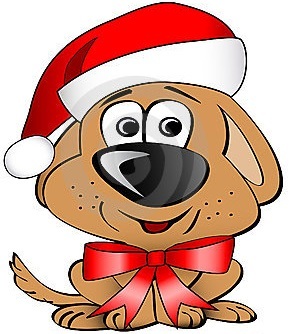 Santa ‘Paws’ will be welcoming dogs to his Grotto where Mans (& Santa’s) best friends will receive a gift in return for a donation to the local RSPCA. This entry was posted in Brighouse, Get Involved / Have Your Say, Nov and tagged Charity, Christmas, Event, Get Involved, Kershaws Garden Centre, November, RSPCA. Lower Valley Friday Flyer 13 November – OUT NOW!! Christmas Fair at Elland Cartwheel this weekend! Children’s book Festival at Rastrick Library tomorrow! Sure Start Children Centre’s recruiting now! This entry was posted in Brighouse, Elland, Get Involved / Have Your Say, Greetland & Stainland, Hipperholme & Lightcliffe, Rastrick and tagged Friday Flyer. 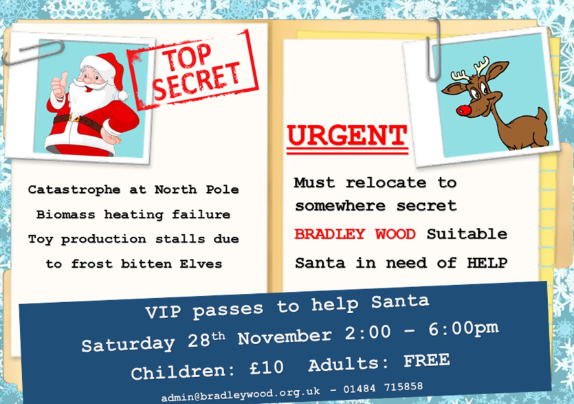 There’s been a disaster at the North Pole and all operations have had to be moved elsewhere with Bradley Wood selected as the perfect location so get involved with festive fun for all the family. The cost is £10 for Children and adults go FREE and with lots of activities and games to try and even some reindeer’s to ride it would be a shame to miss out. This entry was posted in Brighouse, Get Involved / Have Your Say, Nov and tagged Bradley Wood Camp Site, calderdale, Children's Activities, Christmas, Christmas Event, Event, Lower Valley, Reindeer, Santa Claus, Young People. If you and your family are currently using or have recently used local maternity and/or paediatric services then share your views at an informal session and talk about Community & hospital services, Transport issues, Emergency & urgent care for children & young people and Issues about maternity & paediatric services you think important. Only a small number of places are available so please contact moya.kirkman@cvac.org.uk as soon as possible to book your place or call 01422 431094. This entry was posted in Brighouse, Dec, Get Involved / Have Your Say, Rastrick and tagged December, Engagement Champions, Field Lane Children’s Centre, Get Involved, Rastrick, Voluntary Action Calderdale. CMBC are working with the White Ribbon Campaign and other agencies to reduce domestic abuse against women and you can get involved by attending the White Ribbon Campaign Event. This entry was posted in Get Involved / Have Your Say, Nov and tagged calderdale, Domestic Abuse, Get Involved, Halifax, Shay Stadium, White Ribbon Campaign. Cromwell Bottom Needs Your Help This Weekend! Some major work needs to be done at Cromwell Bottom in the reed beds to clear water channels and keep the area healthy for all the creatures that live there and help is required to get the job done. Wellingtons or Waders will be best for splashing about in the reeds, but Boots will be fine for some of the bag dragging outside the reed bed and please take a Packed Lunch & Flask as well as warm Waterproof clothing. If you fancy helping out, in any way you can phone Robin Dalton on 07712 867619. This entry was posted in Brighouse, Get Involved / Have Your Say, Nov, Rastrick and tagged calderdale, Cromwell Bottom, Cromwell Bottom Wildlife Group, environment, Get Involved, Nature, Volunteer, Wildlife. If you have a child who is due to start school in September 2016 then go along to one of two Open Evening sessions at The Greetland Academy for Prospective Pupils. Please contact the school to book your place on your preferred session by calling 01422 372893 and if you have friends or family with children who may wish to attend ask them to get in touch too! This entry was posted in Get Involved / Have Your Say, Greetland & Stainland, Nov and tagged Education, Get Involved, Greetland Academy, November, Open Day, School, Young People. This entry was posted in Brighouse, Dec, Elland, Rastrick and tagged Jobs. This entry was posted in Brighouse, Nov and tagged Bailiff Bridge Junior and Infant School, Job Vacancy.